In the National Council meeting held on the March 28, in your Convenor's address, instead of giving a review of the party's situation and the path ahead, you chose to launch an attack on Yogendra Ji, my father and me, making all sorts of false and inflammatory allegations against us. Your speech incited several Delhi MLAs- (who were invited despite not being members of the NC) to scream that we were "gaddars" who should be thrown out, and behave in the manner of hooligans. Such was the ferocity of the mob of these MLAs and others as they rushed towards my father, that he felt that he may not get out of this alive. You did not even allow us to respond to your allegations. Immediately after your speech, in the middle of shouting and screaming by MLAs and others, Manish read out a resolution for our removal (without any chair, and without anyone allowing him to do so). He then proceeded to call for vote by show of hands without allowing any discussion, forcing us to walk out of what had clearly become a farce. It was farcical for many reasons: Many members of the NC had not been invited or allowed to attend; more than half the people inside the meeting hall were non-members, which included MLAs, district and State convenors of four states, volunteers and bouncers; there was no orderly conduct of the proceedings for many reasons, including the hooliganism displayed by many people there; no independent videography was allowed, the party's Lokpal was not allowed, etc. What has happened subsequent to the 28th, however, has taken the farce to a level where it seems as if a Stalinist purge is taking place in the party. The party's internal Lokpal, a person of immense stature and independence, has been removed unconstitutionally, merely because he expressed his wish to attend the National Council meeting and was seen to be fair; other members of the National Executive are being suspended, again unconstitutionally, only because they had attended a press conference held by us after the hooliganism in the National Council meeting. Thereafter, you have ordered the release of a carefully-edited version of your speech at the National Council meeting, containing various false charges against us, and carefully editing out the portions showing the hooliganism of the mob. It is in such circumstances that I am having to write this open letter to you. In order to respond to your charges, I would need to go back a bit to see where my serious differences started with you. If you will remember, my differences started after the Lok Sabha elections, when a series of things happened which began to show two serious defects in your character and personality. Firstly, you wanted to push through your decisions at any cost in the party, despite the majority of the PAC or the National Executive disagreeing with you. This included decisions that would have undoubtedly been very harmful for the party and against public interest. And secondly, you were willing to use some very highly unethical and even criminal means to achieve your ends. After the Lok Sabha elections, you felt that the party was finished, and could only be revived if it were able to form the government again in Delhi. So immediately after the elections, you started talking to the Congress party for taking its support again to form the government in Delhi. When news of this came out, a large number of important people in the party including Prithvi Reddy, Mayank Gandhi and Anjali Damania called me up saying this would be disastrous, and if this happens, they would have to quit the party. I was in Shimla at that time, I called you up, and I said that you should not go ahead with this unless there is a proper discussion in the Political Action Committee (PAC). I immediately came back and we had a meeting of the PAC at your residence. And at that meeting, a majority of the members - 5:4 - felt that we should not go ahead with forming the government with Congress' support. I had pointed out that this would seem extremely opportunistic, since there was no logical reason for us to change our publicly stated position. I also added that such a government would not last, as the Congress will withdraw support soon, and thereafter, for us to revive the party would become even more difficult. Instead of abiding by the majority decision, you said that while that may be the majority view, as the Convenor of the party, you have the right to take the final decision, and that you would go ahead with seeking Congress' support. At that point, I had a verbal argument with you. I said the party can't be run in this manner, and it has to be run by some democratic means. So it was decided to refer this issue to the National Executive which had many more people. This reference was made by email, and people were expected to vote by next morning. By next morning, again a majority of people opposed this decision in the National Executive and yet, a letter was secretly sent by you to the Lieutenant Governor of Delhi saying that he should not dissolve the Assembly for another week because AAP wants to seek the opinion of the people on whether to form the government again. Immediately after the letter came out, Congress said they were not ready to support AAP and that left us with egg on our face with the result that you had to backtrack the next day and apologize. But despite that, the attempt to form the government with Congress' support or with the support of breakaway MLAs from the Congress continued, as is clear from the sting tape of Rajesh Garg which shows you were wanting to form the government with the support of those MLAs whom you had yourself accused of having being bought over by the BJP for Rs. 4 crore each. How could you even think of forming a government with the support of such people! And this went on till as late as November, just before the dissolution of the Assembly. In November, you called Nikhil Dey and asked him to speak to Rahul Gandhi to convince him to get the Congress party to support. But Nikhil told you that he can't talk to Rahul Gandhi on this issue. Can you deny any of these facts? All this, showed your willingness to go against majority opinion, break all democratic rules of the party, and seek unethical support of MLAs whom you yourself had accused of being corrupt, all in the pursuit of power at any cost. Then came the issue of AVAM or Aam Aadmi Volunteer Action Manch, which was a group of volunteers who wanted their voices heard in the party. Because this was threatening to brew into a rebellion amongst volunteers who felt that they were being used only like slave labour, and because you felt that it was necessary to crush this, it appears that the party got an SMS sent in the name of AVAM, saying that volunteers should join the BJP - the idea was to suggest that AVAM had become an agent of the BJP, though the SMS was fabricated by the party itself in the name of AVAM. And using this, you announced in a Google Hangout that these people had become traitors because of that SMS. And on that basis, Karan Singh, who was the leader of AVAM, was suspended and removed from the party. He appealed to the national disciplinary committee, which I was heading, and he said 'I had been saying that this is not sent by me, please have this investigated'. So I asked you and Dilip Pandey and others to get this investigated, but you steadfastly refused. Eventually, Karan Singh had to lodge an FIR, and the police investigated the matter and it was found that a volunteer of the party, not of AVAM, called Deepak Chaudhary, created this identity in the name of AAVAAM and used that to send that SMS. You should know Arvind, that impersonating an organisation or persons in order to defame them, is a serious criminal offence. Unfortunately young volunteers in the party under your tutelage are being taught that use of such means is OK in politics, since any means used to defeat a "Bigger evil" is OK.
Then came the issue of whether the party should contest Assembly elections in Haryana and Maharashtra. Again the matter was put to the National Executive by email, and the majority - 15 is to 4 - said that that should be left to state units to decide in accordance with our principle of Swaraj. But you did not allow that decision to be implemented. And eventually, it was rendered infructuous, because elections came too close and finally in that National Executive meet in Sangrur it was decided that there's no point, and one should forget about contesting those elections. When the Delhi elections were announced and campaigning started, you instructed volunteers to start a campaign 'Modi for PM, Kejriwal for CM'. I said this is totally unprincipled. It means that our party has gone down on its knees before Modi at a time when it was positioning itself as the main opposition to Modi. When the process of candidate selection for the Delhi Assembly election of 2015 started, I found there was no transparency. Contrary to earlier practice, we were not posting candidates' names on the website. Even the PAC, which was meant to approve the candidate, was not being sent the bio-data or names of the candidates in advance to enable us to check the records of the candidates. In the second meeting of the PAC to discuss candidate selection, because I had received complaints about two of the candidates who were being proposed in that meeting, I pointed this out. You got very angry saying, "Why do you think we will be selecting crooked people?" I said that is not the point - we need to have some transparency and due diligence. That led to an argument between you and me, and I walked out of that meeting and wrote an email on November 27, that I cannot be a rubber stamp for non-transparent and questionable selection of candidates. That email is now in the public domain. After that, in the next list, again there were at least four questionable candidates among the 10 names proposed. Yogendra Yadav and I wrote a letter to the PAC on 10th December, detailing the objections against these four and pointing out that this time, the process of candidate selection was very different from the last time. This time, we were giving tickets to a large number of political entrepreneurs who had joined the party only for opportunism, who had jumped ship from Congress, BJP or BSP at the last moment, who had no ideological commitment to our party, had no record of public service, and whose sources of wealth weren't explained. Some of them were people against whom our party had itself complained that they were distributing money or liquor or had beaten up our volunteers. One of them (our initial choice from Wazirpur), went back to the BJP within 4 hours of us announcing his candidature. Your initial choice for the Mehrauli seat, Gandas, had to be dropped at the last moment only because his photographs were circulated with him showing off, with a glass of liquor in one hand and a revolver in the other. Yet, while he was dropped, his brother was given the ticket. Eventually, even he had to be changed because our Lokpal, Admiral Ramdas gave a strong report against him. Thereafter, AAP stopped having meetings of the PAC or sending names for the approval of the PAC, and started announcing names on their own. When all this happened, I said "Now enough is enough. If this does not stop, and if there is no credible scrutiny of these candidates, I will have to resign from the party and make public the reasons for my resignation." On that, an emergency meeting was called at my residence on January 4, by Yogendra Yadav, Prithvi Reddy etc which had 16-17 people from all over the country, important functionaries of the party. All of them felt that the party's campaign would be ruined if I resigned at that stage. In that meeting I said, "Look, all these kinds of compromises are being made, various ethical corners are being cut and now you are selecting these kind of candidates without proper transparency or scrutiny. If you go with these kinds of candidates, then even if you win, the further compromises that you will have to make, will be such that they will completely destroy the USP of the party, which is of being a clean, transparent party, wedded to alternative politics. And instead of winning by using these kinds of candidates, it would be better to lose the elections by going with clean and honourable candidates". That statement is being twisted around to claim that I said that I wanted the party to lose. I had said that rather than winning by these kinds of candidates and means, it's better to go with honourable candidates and run the risk of a possible loss. Because winning with these kinds of candidates and means destroys the founding principles of the party in the short run, and will destroy the party itself in the long run. If I had wanted the party to lose the elections, I would have resigned and gone public with my reasons at that very time. If Yogendra Yadav wanted the party to lose, he would not have convened that meeting and stopped me from going public. Instead, he worked his heart out for this campaign, defended the party on innumerable occasions on TV. And yet you have the temerity to accuse even him, along with me, of working for the defeat of the party! At the end of that meeting, an arrangement was worked out with your express consent, that: We would immediately refer all the complaints against candidates who had been selected to the Lokpal of the party and his decision would be final. And the rest of the issues of institutional reforms about transparency in the party, accountability, swaraj, inner party democracy - those issues will be taken up immediately after the elections. So those complaints against 12 candidates were referred to the Lokpal. In the 4 days that he had to do this exercise, he recommended the removal of two against whom there was clear evidence, recommended the issuance of warnings against six against whom there was some evidence, and allowed four to continue. Two were thus removed. But the other issue of institutional reforms, which was agreed to be taken up within two days of the election results, were not discussed. Instead, the National Executive meeting of February 26, which you chose not to attend, started with Vishwas announcing your resignation and a no holds barred attack on Yogendra Yadav and myself by members of your coterie. The message conveyed by them on your behalf was clear: That the price for your continuing as Convenor was our removal from the PAC and NE. I then responded and pointed out the things I have mentioned above, and the issues of institutional reforms, but those were not discussed. The only issue that was discussed that day was whether you should continue as Convenor. We all agreed that you should continue, but thereafter, some people went to your residence to meet you, and you made it clear that it's either you or us, and that we have to be removed. And therefore, that is what happened in the next meeting which was held on March 4. A charge that is made against me is that I did not campaign for the party during this election. I had said that I can't campaign for many of these candidates, and given the manner in which these candidates had been selected, I was willing to campaign only for those candidates about whom I was fairly certain that they were the kind of people who would take the ideology of clean politics forward and work in public interest if they win. I had in fact given a list of five people that I thought were decent. But the party did not send me any programme for addressing public meetings. I therefore went for Pankaj Pushkar's public meetings who had personally invited me. The other charge made against me is that I stopped people from donating to AAP. When other people asked me whether they should donate etc, I'd said, "Look, you should donate to those candidates who appear to be decent and honest to you". You and your coterie have made the same charge against my sister Shalini Gupta. She also said the same thing that I had said to a closed circle of friends. In fact she strenuously encouraged the Global group to donate to deserving candidates, which is why several candidates got so much funds from NRIs. Your coterie have also accused my father, my sister and myself of trying to capture the party. Arvind, you know very well that none of us have even wanted any executive positions or tickets for ourselves or any friends or family members. We have only tried to contribute and help in every way that we could to see the party grow into a powerful and credible vehicle for alternative politics in the country. My father, apart from donating more than 2 crores as seed money to the party, has spent an enormous amount of time in giving selfless advice, legal and otherwise to the party. He played a major role in the draft of the Jan Lokpal bill. He worked for the well being of the party with his "tan, man and dhan". Yes, when he felt that you, for various reasons were not the right person to lead the party organisation, he frankly told you so. Apart from the reasons of ethical compromises mentioned above, he also saw that you were violating the constitution and rules of the party repeatedly, not allowing any working structure of the party organisation to be created (other than a coterie), and were not interested in formulating the policies of the party. For two years, the elaborate reports of the 34 policy committees that we had set up, have been gathering dust because you havent found the time or have the inclination to look at those reports and apply your mind to them. You accuse my father of having stated that you were his third choice for CM after Kiran Bedi and Ajay Maken. That was his honest view after seeing all the shorcomings in your character that he had been observing. I had immediately publicly disagreed with his opinion, but in the light of what has transpired subsequently, particularly the stage managed lumpenism that you got unleashed in the NC meeting, I regretfully wonder if he was right. My sister Shalini Gupta, as well as many other highly qualified persons, left their lucrative jobs abroad to help you build credible and efficient systems which would have proper cells and expertise so that it could function as a world class organisation. On repeated occasions you had yourself asked Shalini to give up her job for the sake of the country and said that her role as Organization Development Advisor was only an advisory role and not a formal position with any power in the party as discussed in the PAC before she was appointed. However it became clear over time that you did not want any professional advice in this matter. Instead you asked Ashutosh who has no such professional expertise to come up with an alternative plan to make each cell of the party organisation an appendage to your coterie and accountable only to you. It is true Arvind that I have not contributed as much as you for the party. I have not fasted, nor gone to jail. I have been mostly involved in my various PILs against various scams, 2G, Coalgate, the CBI director, 4G, the Reliance Gas robbery, against GM foods, Nuclear Power Plants, destructive Hydel projects, Section 66A, Tobacco and Gutka, etc. I have spent the rest of my time giving legal and other advice to the party and fighting its cases in court. I have never been interested in any executive posts and I have seen my role in the party mainly as a person who will try and ensure that it remains true to its founding principles. And it is for this reason that I have raised my voice whenever I have found it to be slipping from its path. Arvind, this party was founded with a lot of idealism by thousands of people, especially young people, who came out and spent a lot of their time, effort, energy, money, sweat and blood in order to create a vehicle for alternative politics, in order to create a party that would practice clean and transparent politics. But unfortunately, all those principles are being betrayed by you and your coterie, who are currently in control of the party. And it has become a supremo-oriented, high-command culture kind of party. You feel that you can rectify everything by running the Delhi government well in the 5 years that you have. You think that if you deliver on governance, people will forget what you have done to the party. I wish you well in that endeavour. Even traditional political parties like Congress, BJP have done some governance. But the dream that we started with for clean and principled politics and corruption free governance was much much bigger. The fear that I have, is that after how you have behaved and the character traits that you have showed, this dream of clean and principled politics that the Aam Aadmi party was founded on may well turn into a nightmare. But still, I wish you well. 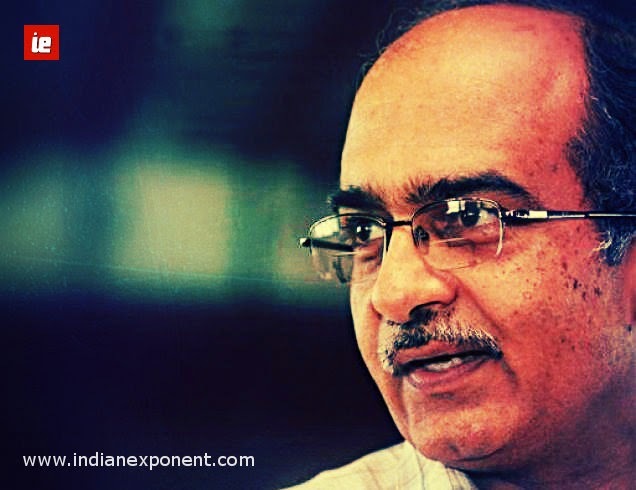 Prashant Bhushan is a famous lawyer-activist whose public interest litigations have helped expose major scams. He is a founding member of the Aam Aadmi Party.